What type of commercial ice machine do I need? What type of ice machine do I need? In the last blog we covered the different ice types that you have to choose from out there in the commercial ice machine world. 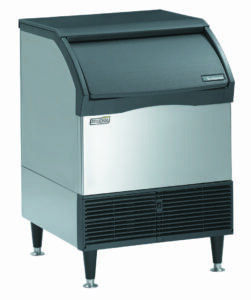 Now, we’re going to focus on the different commercial ice machine types that are available. The under-counter is always self-contained and usually front breathing, (depending on the manufacturer). A couple nice things about these is that, although compact, they can produce a pretty decent amount of ice per day and they are really easy to scoop ice from. The front breathing feature means that it can be installed with equipment at both sides, (counter above etc) and will not over-heat. This type is available as a cuber, flaker or gourmet-style cuber. This type of ice machine actually comes in two parts. One is the actual ice maker (that sits on top) and the other is the storage bin that the ice maker sits on top of. What does that mean to you? It means that you can mix and match different size ice makers with different size storage bins. For example you could match a 1,000# cuber with a 500# storage bin. Or, you could mate a 500# ice maker with a 1,000# or bigger storage bin. Usually, what dictates the sizing is “how” you use ice. That is a subject we will cover on a different blog. So, essentially the ability to mix and match different size components is what is meant by “modular.” When you are in need of higher quantities of ice, either in storage or production, you will need most likel need to consider the modular-type of unit. Modular ice machines produce all ice types (except the gourmet-cube). On the left is a ice and water style dispenser and on the right is the type of dispenser you would typically find at a hotel or motel. These are specialized units that are designed for pretty specific applications. 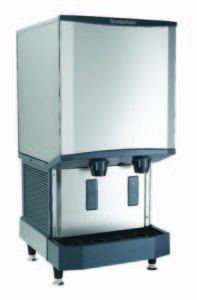 The “touch free” feature on the water & ice dispenser is excellent for the healthcare environment, serving staff and visitors in break-rooms and office suites. These units are packed with the latest in ice making technology and can produce a high quantity of soft chew-able ice that most everyone loves! The hotel/motel dispensers are the best ice machine type for that industry because they keep the ice storage away from the public. They are easy to use and dispense a high volume of cube ice quickly into buckets etc. 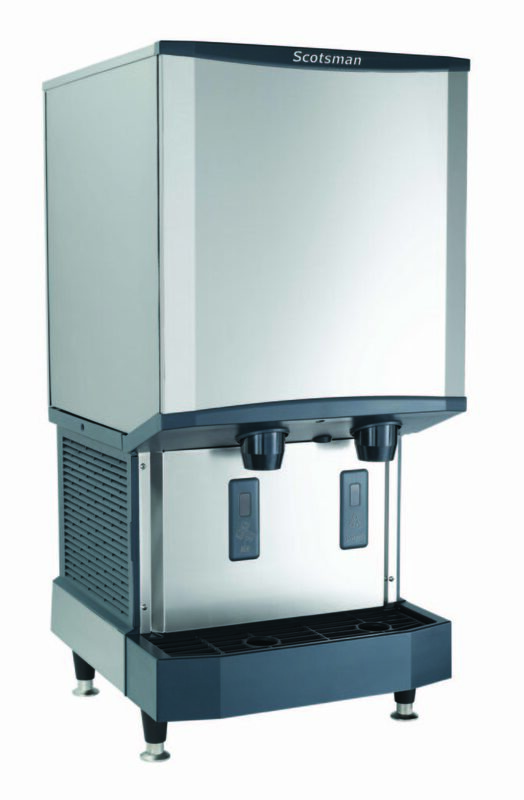 Water/ice dispensers come in two styles, counter-top or free standing (comes with stainless steel stand that puts the unit at counter-height). Hotel dispensers come in two formats, 22″ and 30″ wide. So there you have it. The three most common types of commercial ice machines out there today. AJAX can help you decide what type is the best for you and provide a competitive full-service leasing, sales, and/or installation quote! Contact us today as we would love to have a conversation with you because frankly we love ice machines! They can be really tricky and confusing but they happen to be one of our most favorite things out there (I know, weird right?) as we have so many years of experience with them!! We’ve dialed in all the best machines, water filters and ways to get the best fit for our clients. We want to share our knowledge, experience, and love of all things ice-machine with you! Check out our testimonials and clients page if your considering it but not sure yet! 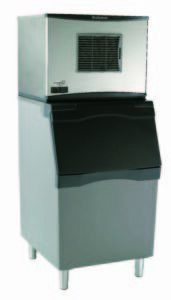 Let us make purchasing, leasing, installing and/or repairing a commercial ice machine as easy as possible for you!! We’ll do the work so you can enjoy the ice!